Receive the following certificate when you make a High Holiday / Yizkor donation of $90 or more. Many children in Sderot suffer from PTSD due to the constant missile attacks from Gaza targeting their city. JNF Canada is proud to help support the establishment of an extensive petting zoo courtyard on the grounds of the Centre for Animal-Assisted Therapy – Sderot Resilience Centre. The centre will help the children of Sderot deal with their trauma through interaction with animals such as goats, mice, dogs and rabbits. This therapy is a substantial addition to the toolkit of the resilience center therapists. We recite Yizkor each Passover to remember the loved ones who are no longer with us. 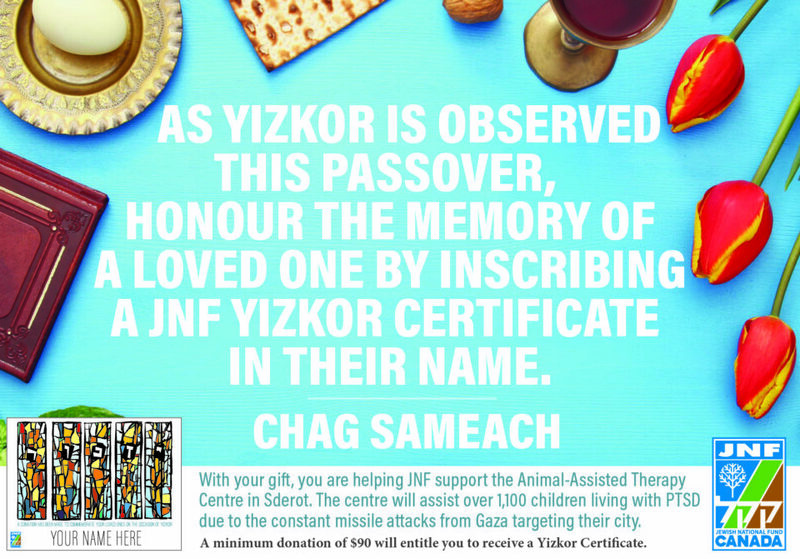 A donation to the JNF Passover Yizkor fund will allow you to commemorate loved ones and make a commitment to the welfare of the children of Sderot. We wish you and your families a Chag Sameach!